The Coming Storm is here! 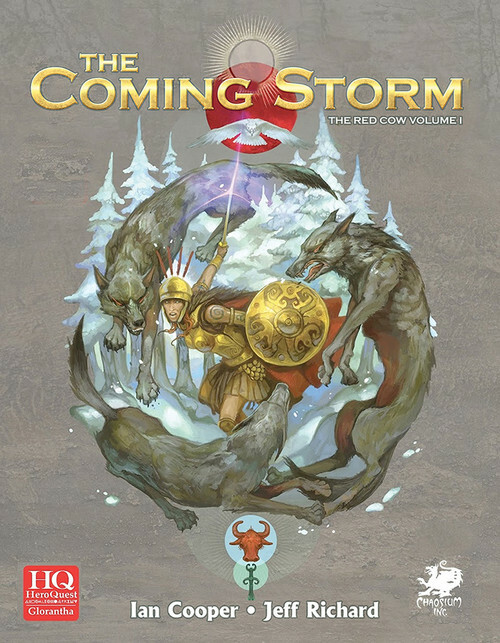 Ian Cooper’s Red Cow Saga aka The Coming Storm is out in pdf form via Chaosium.com. If you buy the 150 page pdf now they will deduct the cost from the printed version when it comes out later in the year (no eta yet). This part 1, which meticulously details the Red Cow, their lands and their enemies (lots of maps and character portraits as a result), while part 2 which should be along shortly is all the adventures. Join in the discussion with author Ian Cooper over on Rpg.net. Ian gives lots of detail about the supplement, for example why its been split into two parts, and is open to questions. Here’s some page layouts, which give the table of contents, that Ian posted on the above thread. and of course Jon Hodgson has turned in another awesome iconic cover for the book.